Shinedown (pictured l-r): Zach Myers, Eric Bass, Brent Smith, and Barry Kerch. Since releasing their debut album on Atlantic Records in 2003, hard-rock band Shinedown has steadily built a worldwide following with millions of dedicated fans. Impressively, all five of their previous albums have been certified either platinum or gold, with their 2008 album The Sound of Madness, reaching double platinum. Originally from Jacksonville, Florida, Shinedown was formed in 2001 by Brent Smith. He is the group’s frontman and main songwriter, and he writes most of the lyrics. Another key songwriting contributor is Eric Bass, who’s been with the band since 2008. Bass is also the producer of the new album. 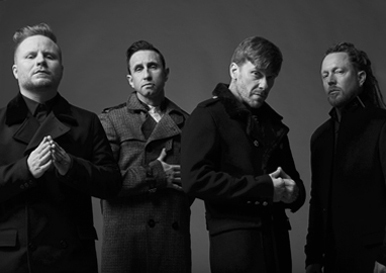 Here’s a brief rundown of Shinedown’s album releases (all on Atlantic Records): Leave a Whisper (2003); Us and Them (2005); The Sound of Madness (2008); Amaryllis (2012); Threat to Survival (2015); and ATTENTION ATTENTION (2018). The band has also released many singles that have reached Top 10 on the pop and/or rock charts: “Second Chance” (2008); “If You Only Knew” (2009); “The Crow & the Butterfly” (2010); “Bully” (2012); “Unity” (2012); “Cut The Cord” (2015); and “Devil” (2018). We are pleased to do this new Q&A interview with Brent Smith and Eric Bass of Shinedown. They discuss their new album, their songwriting, and the videos they’ll be filming for each song on the album. DK: I read that your new album, ATTENTION ATTENTION, is a concept album. Is that correct? Eric Bass: It’s probably the closest thing to a concept record that we’ll ever do. It’s a larger story—each song is its own thing, but it culminates in something much larger. It kind of became a concept as we were writing. We started out as we always do, just putting together songs, and we realized that it started to become this common theme that was running through all of the songs. And once we sat back and looked at that, it sort of became our mission to turn it into a concept record from there. Brent Smith: Back in 2016 we were were on tour, and at the end of the year, we had a big arena tour with another band. [At the time], Eric didn’t want to drive himself crazy being bored all day, because we were at the end of a cycle per se, and he needed something to do. So he took it upon himself to bring his Pro Tools rig out to the venues, and every day he would just go in…he would find a room and set up, and he would write a composition. Eric ended up writing like 22 pieces of music, and by the time we got into 2017, he started to play me a lot of the material. And it sounded as if it all belonged on the same record, and the ideas and the music were telling a story. The interesting thing about making ATTENTION ATTENTION, when you break it down, we still wrote almost everything from scratch. I think there was one piece of music that we used from those original 22 compositions. Bass: Honestly, the way that I approached it, was that we had those pieces in reserve, and I much preferred to sit in a room and come up with something from scratch, because it’s always more organic that way. But we always knew that we had these other compositions in our back pocket if we needed to go to them. It really helped as a springboard to get the creativity started, prior to the writing process. DK: What is the storyline of your album? I read that it starts a little darker, and then becomes more positive. Smith: The album is really about not being afraid to fail. I think that there are dynamics in some records where there’s a lot of symbolism about overcoming certain situations and building yourself back up, and being positive and living a positive life, and trying to look at the good in everyone. Sometimes, I feel like that those records might seem a bit fake or made up a little bit. You’re kind of pulling it from a place that doesn’t exist. That’s not what ATTENTION ATTENTION is about. All of these songs are all about real people, and it’s all about real situations, and it’s that dynamic of not being afraid to fail. I think people will sometimes put themselves into a corner, and kind of paralyze themselves mentally, [when they try to] achieve something that they don’t think that they’re capable of doing. But I don’t think people will be defined by their failures, as much as they’ll be defined by the fact that they didn’t give up. And that’s the point of ATTENTION ATTENTION. I think that you’re going to fall into a hole sometimes, and they’ll you’ll try to figure out how to get out of it, and that there’s a willingness on this record for the person involved in this story, that they’ve come to a crossroads. They’ve figured out that in order to go forward, they’re gonna have to confront some situations from a psychological point of view, and even an emotional and physical point of view. It’s a pretty deep story, and it’s very broad. There’s a lot going on in this album. DK: The first single from the album is “Devil,” which is moving up the rock charts. Can you talk about how ‘Devil” fits into the overall storyline of the album? Bass: “Devil” is the first track on the record. As the record starts, you hear someone walk into a room, and they pull up a chair, take a deep breath, and “Devil” starts. Really, the entire record takes place with that person sitting in that room, coming to terms with their life and what they’re going through, and how to overcome. But “Devil” is [hitting] rock bottom—it’s about trying to figure out how you got yourself into this situation. There’s a lot of anger in it, and it’s a big warning shot too, that the devil’s right there, right beside you. And whatever the devil is for you, whether it’s substance abuse, depression, whatever your vice is…it’s being at rock bottom, and that coming to a realization that something has to be done about your situation. DK: Later on in the album, I like your ballad, “Get Up.” How does this song fit the storyline of the album? Bass: If you want to start with “Get Up,” “Get Up” is actually the genesis in a lot of ways for what ended up being ATTENTION ATTENTION, as far as lyrically. Because after we wrote that song, we realized that everything had a theme running through it. We had been working on the music for “Get Up” for a week or so, and lyrically it wasn’t coming yet. Then Brent came in the studio and said, “I’ve got something I want to sing for you,” and he sat down and started singing what would become “Get Up.” It was very personal, because he told me that he had written it about me and my depression. And it’s kind of about the two of us. If you listen to the first verse, where he’s singing to someone, and then he puts it on himself. When that song was written, I think it made it okay to continue writing about very personal things. So it was sort of the launching point for what this record ended up being. It’s exactly what it is…there’s not a lot of metaphor in there. It’s get up and get out, and pull yourself up. Smith: Yes, we wanted to make videos for every song, because the whole album is a story. It’s important to not only tell the story sonically, but visually as well. We started working with director Bill Yukich, who did the videos for “Devil” and “The Human Radio.” Bill has worked with many other artists; he was the main editor for Beyonce’s video “Lemonade,” and he’s worked with Marilyn Manson and Johnny Depp. In our videos for “Devil” and “The Human Radio,” you can see that there is someone that is dealing with an emotion, that you don’t know whether or not they might be “hallucinating,” or if they’re actually standing up to a lot of the demons that are in their mind. If you notice in the videos, there’s quite a few sections in those videos between “Devil” and “The Human Radio,” where you’ll catch a frame of just the chair in the room. This is because that’s part of the story, that the whole album takes place inside of a room, as well. DK: Thank you Brent & Eric for doing this interview. Is there anything else that you’d like to mention for this article, that we haven’t talked about yet? It’s been interesting, because there were quite a few people over the last two years, that had an opinion about what they would like to hear us do in the future, in regards to the albums that we make. We listened to a lot of different people during the last two years, and when we went into the studio, we kind of kept them with us. I remember there was a young, teenage fan we met in the beginning of 2017. We were doing a meet & greet, and he asked if he could talk to me at the end of it…he had a couple of questions. I said, “Well sure.” When we got done with the meet & greet, I went over to him and said, “What’s up, man? What can I do for you?” He said, “I really appreciate your catalog—I love what you guys do. But I do have a request for the new record, because I know you guys are in the middle of making an album.” And he said, “Can you make it heavier?” You know, heavy can be looked at in different ways. It can be looked at from a music standpoint. It can also be looked at from a percussive standpoint, and even a lyrical standpoint. But at the beginning of this album, we do a little wink to the audience, and a little bit of a tip of the hat, with “Devil” being the first single and the beginning of the story. And that is, “You asked for us to make a heavier record, so it’s about to get heavy. We want our fans to take a journey with us on this record. There are a lot of ups and downs…it’s definitely an emotional roller coaster. For the people that are listening to this record, we want them to put themselves inside that room with us, in that chair, and go on this journey with us. We would also like to say thank you to our audience, for giving us a platform to be ourselves and to make a record like this, because without them, we wouldn’t have been able to do it.